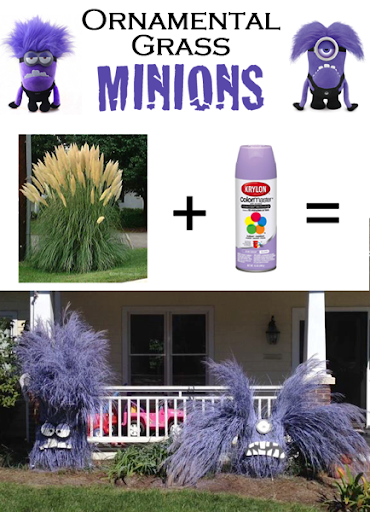 Turn Your Landscaping into Minions! Sometimes it is funny how fate works. As of 8 PM last night I didn’t have a post scheduled. I have been really busy getting my Halloween Home Tour ready and I felt bad about it but I was going to skip posting today. But then a friend of mine posted the most awesome Halloween landscaping project on her Facebook page and I just had to share it! You typically don’t see landscaping or outdoor projects from me because I don’t have a yard, so that makes this post even more awesome. It is something I never even would be able to pull off, even if it had been my idea (which it totally wasn’t!). Next they covered up any surface they didn’t want to damage (you can see the drop cloths in the photos) and sprayed the bushes with purple paint. I love this project so much. It is so simple, yet so creative. I knew my readers would love it! I am sending a huge thanks to Lara (and Don) for this super great idea, and for letting me share it with all of you! Apparently this blog is a team effort these days!